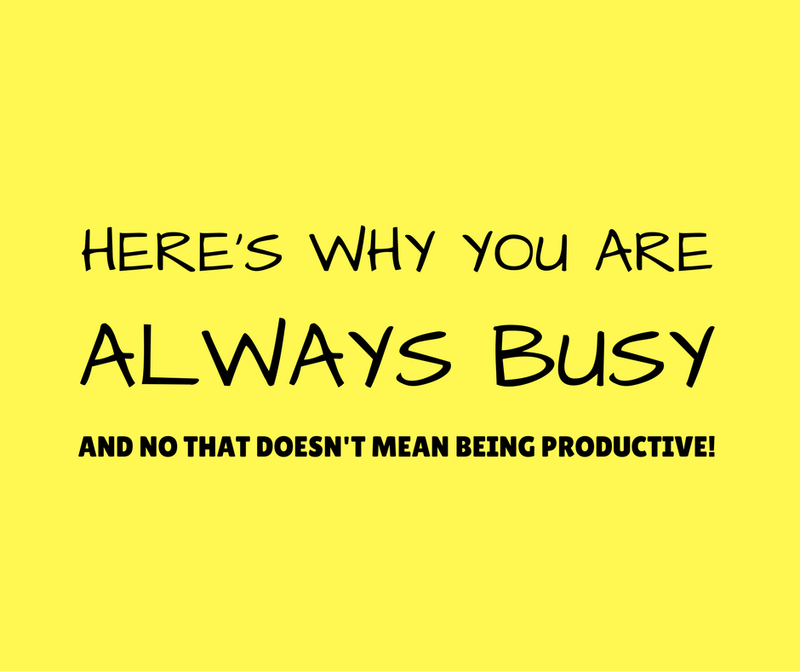 Here’s Why You Are Always Busy & No That Doesn’t Mean Being Productive! Busyness and productivity are not synonymous. Being busy and being productive are not synonymous. 1. No Clear Goals: Let’s be honest, it’s like waiting for the bread to rise while the oven is powered off. If we don’t know what we are doing or our intention behind it then we really don’t have anything to measure our progress. With goals there is a clear picture of what you’ve accomplished and what needs to be done. It’s no point being busy doing things that doesn’t help us achieve anything. So next time you feel like you’ve been busy all week but nothing’s really been done ask yourself if those things were goals set by you in the first place or not. 2. Not prioritizing: This is a no-brainer and obviously follows goal setting. As it is, we are bombarded with tons of stuff coming our way from every nook and corner that it gets overwhelming at one point. With goal setting comes the challenge of prioritizing what needs to be finished. Remember, you cannot do everything all at once but one at a time. It took me some time to realize this but believe me it’s made my life simpler now. Everywhere you look, everyone is in a hurry. Why shouldn’t we? We’ve got things to do. Tons of things to do! But unless we prioritize, we’ll always be busy. 3. No routine: It’s nothing to do with being a late sleeper. If you’re a night owl and feel you get things done more efficiently when your children are in bed then go ahead by all means. And no, it’s not that only early risers get things done well. If you like welcoming the sun and then getting things completed, good for you! It all depends on the person’s preference and biological clock. What is preventing you from not using the time properly is no routine at all. What matters is that you stick to your routine and maintain it for a period of time so it becomes your habit. We all have 24 hours in a day and no one gets an hour extra. Not even a single soul! It’s for us to devote certain extra hours either at night or morning to get things done on our priority list and make space in our schedule. 4. Doing a lot: To better explain this let me tell you about this waiter I was watching at dinner once. It was a decent sized table for the two of us dining. The moment we finished anything, this particular waiter would come and ask us if he could clear the table. Know that there was enough space for the serving bowls and glasses. This was a restaurant that opened recently and not many people were around and this waiter kept going and clearing away dishes and glasses from every table whenever he could while the other waiters went only at the end. Now I know that’s good hospitality but doing it again and again was more like interruption. We just wanted a quite meal and a conversation and he could have cleared once we were fully finished! This waiter was clearly doing a lot and thus it became a bit disturbing for us. Similarly, we find ourselves doing more, thinking the more we do (rather than sitting idle) is the way to be. Doing a hundred things that keeps you busy but not productive is a waste of time. I’d prefer doing five things that mean business compared to twenty different things in a day. 5. Using It As An Excuse: But I really do have genuine things to take care of! It’s just that I am always busy and I get no time. If that’s the case then doing your genuine things should not weigh you down. If they are, then clearly they are not genuine. It’s a sad thing but true that a lot of people have actually gotten into the habit of using being busy as an excuse. Up for a theatre show this weekend? Can’t do, I’m busy. Tried calling you. Oh sorry, been busy so missed your calls! A simple plain excuse and that’s all. In truth, many are just plain lazy to actually come up with a better excuse. It’s disappointing because it devalues the efforts of people who are actually working hard and are truly busy. But being truly busy doesn’t have to guarantee you’ve been productive. For example, you missed your package and have to go pick it up at the post office. That’s truly busy but is it being productive? I’d like to think not! Remember, being busy does not mean being productive! But then again, that’s another story, for another day. If you like what you just read, please hit the green ‘Recommend’ button below. The Productivity Trap or How To Stop Doing ALL THE THINGS.